September has been a rough month so far for the Motörhead camp, with cancelled shows and questions surrounding the health of Lemmy Kilmister overshadowing the latest stretch of their tour. Rolling into Toronto, they seemed determined to give the beer drinkers and hell raisers of Riot Fest something to roar about. 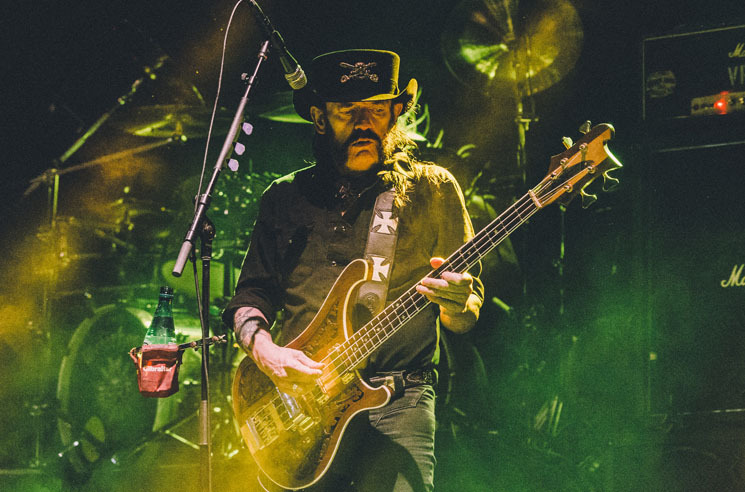 But as the opening riff of "Bomber" started the set, Kilmister's vocals lacked force and enunciation, a problem compounded by a less than desirable mix that pushed his distorted bass tones out in favour of Mikkey Dee's drums. For all the noise the trio made on stage, it took a bit of work to get the crowd to reciprocate. "There's thousands of you fuckers, and only three of us," Lemmy snarled into his microphone. His vocals fared much better when less range was required, impressing with "Lost Woman Blues" and then "Doctor Rock," which included a thunderous solo section from Dee. The vocal issues unfortunately returned as the band closed with "Ace of Spades" and "Overkill," both played noticeably slower than many were used to. Down, but never out, a bit of time off the road could prove useful for the legendary trio to heal up and return to the peak of their powers.